The concept of paying it forward is one which can truly benefit many and was featured in a great movie from 2000 starring Kevin Spacey, Helen Hunt & Haley Joel Osment. It reminds me of a commercial from the 1970s for Faberge shampoo in which they had the expression “if you tell two friends and they tell two friends, and so on, and so on…”. In business, there are SO many ways in which this concept can take hold. But to me, the greatest impact of this wonderful approach to helping can be done at the grassroots, or individual, level. I myself have experienced both sides of paying it forward. I have had the great fortune of being helped by many people along my career path. And to be clear, these folks did not do so with the expectation that they would receive anything in return; but rather for the sake of helping me out at a time when I was in need of assistance. I have had a few great mentors who took me under their wings and guided me through then-uncharted paths within my career. I am humbled by the unselfish nature in which this help was given and greatly benefited from it. It is, in large part, the reason I am where I am in my career. So, in the spirit of paying it forward, I now offer assistance to others whenever I can so that they too can benefit from outside perspectives and guidance. I participate on the board of a non-profit [Reading Partners], I mentor colleagues both within and outside my company whenever I am able to, and I encourage those in my village to do the same. There are a couple of great commercials from Liberty Mutual insurance company that totally inspired me to write this entry and to shine a light on the notion of paying it forward. These commercials show how one person witnessing someone helping someone else, can find that helpfulness within themselves to pay it forward. If each person who reads this blog entry, thinks about one person they can help with the explicit ‘rule’ that that person must repay the favor by helping someone else, imagine how quickly this valuable concept can generate massive good. Think about it, mathematically it doesn’t take long for things to grow incredibly fast as shown in this great piece by Alan Yu called “A Penny Doubled Everyday“. Starting with just one penny on day 1 and doubling the number each day, in just thirty days, you’d have over $10 million dollars…$10,737,418.23 to be exact. As leaders, we must be sure to foster a culture in which people understand the value of helping one another. I try to do this as often as I can and those who work with and around me, are always welcomed to ask for assistance or the time to assist others. We all have times in our lives where we need(ed) help. The greatest thing we can do with what we have learned is to share this knowledge with others in our networks so that they too can benefit. It’s like, as Wally Bock asks, “what do you want to be remembered for?”. Nina Nets It Out: Be sure to take every opportunity to help others and to ask them to do the same for people within their network. If we can create an atmosphere in which this type of behavior is commonplace, recognized and encouraged, the limits we have are boundless. And in these difficult times, helping others will be appreciated tremendously by all involved. Excellent advice. I’ve just joined a networking group, and I’m trying to go into it with the attitude of “what can I do to help others?” rather than “what can I get out of it?” I’ll be very interested to see where this approach can lead! Please update me and let me know how this attitude / approach works out. I have my suspicions, of course, but would love to hear your real world experience. Thanks for your readership and support. Great post! What Would Dad Say just wrote recently about the old saying, “It’s not who you know. It’s who knows you.” Paying it forward is one of the most significantly effective ways to get people to know and remember you. Very useful advice for all professionals, but especially job seekers! Thanks as always for your readership and support. I think you are spot on when saying that paying it forward is a most effective way to get known. And for those seeking jobs, being known is a good thing; especially if you’re known for doing goof for others! It surely can’t hurt. Heard of multi level marketing a.k.a MLM… When I heard it for the first time was inspired…. but as days passed on understood the true meaning of it…’coz ppl talk how much it is worth for… But Pay it forward will impress any one who peeps into this blog entry…’coz it is something which is invaluable… Excellent piece of info abt Benjamin Franklin..
Hayli: Nice quote. During youthful days, one used to ignore what old’s say… but as one starts becoming old… i mean when one starts experiencing more in life… one thinks “Old is Gold “. Thanks for commenting. I like the analogy between MLM and paying it forward, especially how you show that paying it forward is so valuable. It truly is a very powerful concept and even if implemented on a small scale, can generate tremendous benefits. Try it…you’ll see what I mean. Volunteers from our company and friends from around the US are launching a similar concept. We are encouraging everyone we know or meet to take all of their loose change from home, car or office and give it away tomorrow to some one who will use it immediately on Main Street. A homeless person, a shelter, a place which employs teenagers and has a tip jar, a food bank… would each spend that money that day, at a business which will in turn spend it again for goods and services. Of the $50 billion in coin in the US, some estimates suggest over $12 billion is sitting in coin jars, drawers and other nooks, never to be rolled up. At the grass roots, Americans can pump $12 billion into our local businesses in a matter of days. Then watch that money course through our economy multiple times. No one loses, every one wins. Truly, acting locally will benefit every one locally, nationally and globally. This is a great idea and I will gladly join in the effort. Something that I have done is to participate with a local non-profit that is doing things that I respect and value. I realize that schedules are busy for many folks, but the feelings that you can get from contributing to a good cause are worth the extra schedule burdens. I recommend everyone do this, even if only for a brief few hours a month. Your point about acting locally is quite true. Local benefits can grow to demonstrate impacts nationally and globally! Looking forward to learning more about your Change=Change efforts!! Nina, we appreciate your support and enthusiasm! If every American donated $10 in change (even if all pennies) this week, we instantly would inject $3.2 billion into our Main Streets across America! With the velocity of money (the multiplier effect) that could have the impact of 5x or more into the economy. Not a bailout, or a debt guaranty or toxic asset purchase. But a true stimulus to our neighbors. It’s quite amazing when you think how quickly something like this scales to significant levels. Sort of the same as my “penny doubled everyday” example. I look forward to hearing about the progress of your efforts. The “pay it forward” concept of investing or just plain giving is what I have operated on my whole life…but the new society and some of the Gen Ys and Xs seem to have no idea of how to be fully accountable for being the recipient of the forward pay! When I have shown generosity beyond normal (which i s probably why this didn’t work) to many colleagues and employees and have gotten burned about 75%-100% of the time. A conservative gesture always seems to work better, as a grandiose one tends to astound then overwhelm typically. A lunch or a quick call to thank someone with a sincere message seems to work more effectively. Too bad nobody returns equally what you give these days. Again, thanks so much for your thoughts and for helping me consolidate mine! 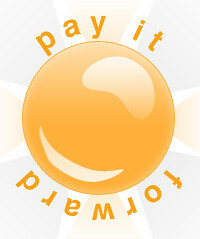 I don’t disagree that the pay it forward concept works well with just simple gestures. In fact, that is why I like the Liberty Mutual commercials so much. They show simple gestures of one person inspiring gestures from and to another person. It is this chain of giving that I believe so strongly in. It is, in some sense, why I chose to write this blog and why I choose to mentor others. I have had people in my life help me and now I want to pay it forward and help others. Nothing grandiose; just plain old listening, advising, encouraging! Unfortunately, when I started “paying forward”, I got a push back since the team had new entrants who considered themselves an expert PM and didn’t want to feel that they can be “coached” anymore. I very well knew that although an expert PM, they were totally inexperienced in the technical world that governed our program and hence, wanted to lend a helping hand, however, my help was not taken kindly. While leadership wants me to share the success tips with my peer PMs, my teammates have blocked any communication. Being sandwiched in this politics, I am not sure how do I pay forward, given that I know my communication can help the program a great deal.